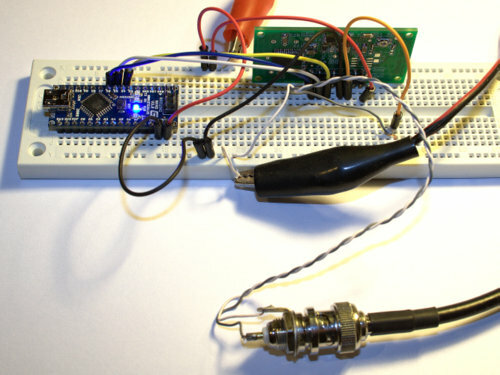 I have been meaning to find some time to work on interfacing an Arduino to a AD9851 or DDS60. I decided to grab an Arduino Nano from the parts bin (next to some Uno's another Nano, some shields, some PICs, etc) and a DDS60. I figured that there must be some existing code examples on the Internet to get me started. My friend Google found some likely starting points. I made a couple of quick changes to pin layout and removed the LED piece and saved it off as a sketch. The total time to connect everything up, build (steal) the sketch, and test was about 30 minutes. Sure enough it is making RF. I was reading about 3.72dBm or about 2.25mW. With a signal at 10Mhz all of the harmonics thru 80Mhz were 54-62dB down from the fundamental. 90Mhz had a harmonic 47dB down and at 180Mhz it was 43dB down. 180MHz is 6x the crystal on the DDS60 board. For a quick project it was pretty fun and successful. I need to bond with the code a bit so that I build my own code base that can talk to the AD9851 for some future projects.